Initially we both started to look online at different suitcases, for me I was looking at the designs and for Martin he was looking for the weight. The reason we want super light suitcases is because then we can pack more, due to the weight restrictions of suitcases on flights. This is mainly for on the way back because we will be bringing back as many of Americas sweets as we can pack!! After searching online, we decided that you don’t get a true feel for a suitcase unless you see it, feel the weight and see the design. I was dead set on having a hard case until I started looking in shops. There are a lot of places that you can go to get a suitcase, especially during holiday season (June – September); TK Maxx, Debenhams, Matalan, Argos, Tesco, Sports Direct, and many more. Hot UK Deals website, showing one of the many suitcase deals. 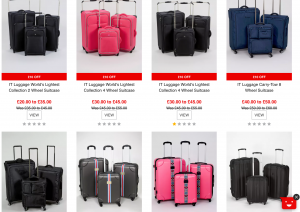 Hot UK Deals is a good website for deals in general, but I only considered places like Debenhams after I saw that their suitcases were on sale. Ultimately we settled for our suitcases from Matalan, they were the lightest ones that we could find, and we both got a cabin case and a large suitcase each. Both of my suitcases are orange and his are grey but they also all match in design (which I love). Suitcases isn’t the most interesting subject, however it is something that you should think about before you start packing, and preferably with enough time to go out and search for one that you like before you need it.